The first four books of the New Testament are known as the Gospels: Matthew, Mark, Luke, and John. Each book tells us about the life, ministry, death, and resurrection of Jesus Christ. Let’s get a high-level overview of these four books, what makes them different, and how they’re similar. The Gospels are where we find all the famous Bible stories about Jesus. Because each Gospel is about the same main character, they all share several elements. Maybe that would be the case if Jesus were a regular person who just did regular things. But he isn’t, and he didn’t. John says that the world itself couldn’t hold all the books that could be written about Jesus’ ministry (Jn 21:25). He’s probably being hyperbolic, but if there’s that much to say about Jesus, then we shouldn’t be surprised that we have multiple accounts of him in our Bible. If the world couldn’t hold his whole story, then surely a 16-chapter pamphlet like Mark couldn’t! We have four gospels because during the early church period, four people found it necessary to tell the story of Jesus from four different perspectives. Each gospel was written for a different (original) group of people, by a different author, who was trying to accomplish a different purpose. Traditionally penned by the apostle of the same name, Matthew is the first gospel of the four. This gospel was written for people familiar with the Old Testament, both the Law of Moses and the prophets. 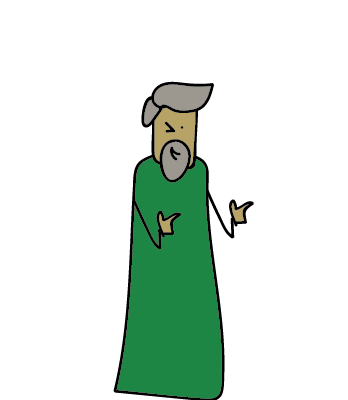 Matthew makes more references to the Old Testament than any other gospel. Today, Matthew is the perfect book to bridge the gap between the Old Testament and the New. In the famous Sermon on the Mount, Jesus says, “Do not think that I have come to abolish the Law or the Prophets; I have not come to abolish them but to fulfill them” (Mt 5:17). You can read an overview of Matthew here. This is the shortest gospel. In fact, it’s possible that this gospel was written so that it could be easily memorized and told aloud—written to “go viral,” if you will. According to early church tradition, this gospel was written by John Mark, the same guy who backed out of his missionary journey with Paul and Barnabas (Ac 15:37–39). Mark purportedly aided the apostle Peter later in life, and this gospel is an arranged collection of Peter’s memories of Jesus. Mark was written for a wide audience. This gospel focuses on Jesus’ role as the suffering servant and son of God. While the other gospels contain long discourses and sermons of Jesus, Mark is all about action. This is where we see Jesus doing things, and then doing more things. 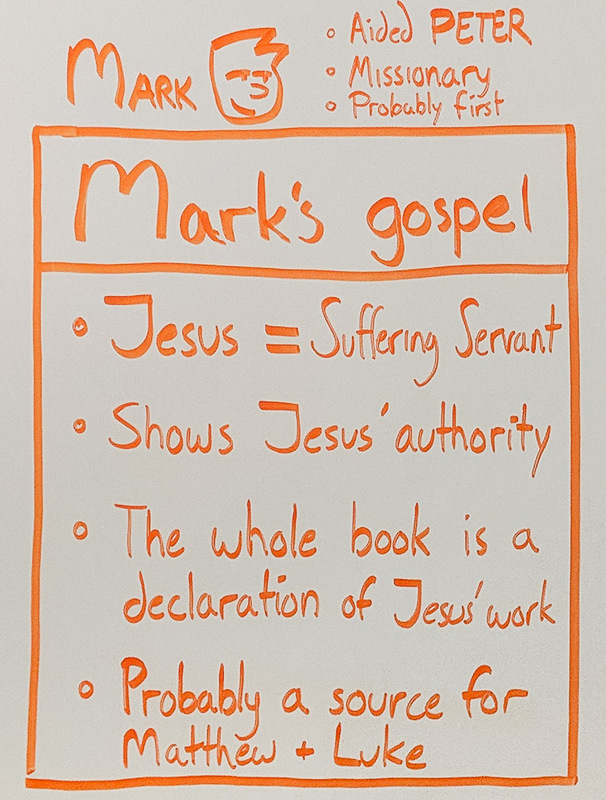 It’s very action-oriented (the word “immediately” shows up frequently), and of the four gospels, Mark reads most like a story. You can read an overview of Mark’s gospel here. This is the longest of the four gospels—in fact, it’s the longest book of the New Testament for that matter. Luke is the historical, journalistic Gospel: a thorough account of the episodes in Jesus’ life arranged in chronological order. This gospel was written to establish believers in the teachings of Jesus (Lk 1:1–4). Church tradition recognizes the first-century physician Luke as the author and editor of this book, which is how it gets its name. Luke may be one of the only non-Hebrew authors of the Bible based on a few clues we pick up in the New Testament. This gospel presents Jesus as the seeking savior of all nations (Lk 2:30–32). It was and continues to be a rich story of Jesus’ life and ministry for both those who don’t know much about Jesus and those who have a great deal of familiarity with the Old Testament. You can read an overview of Luke’s gospel here. 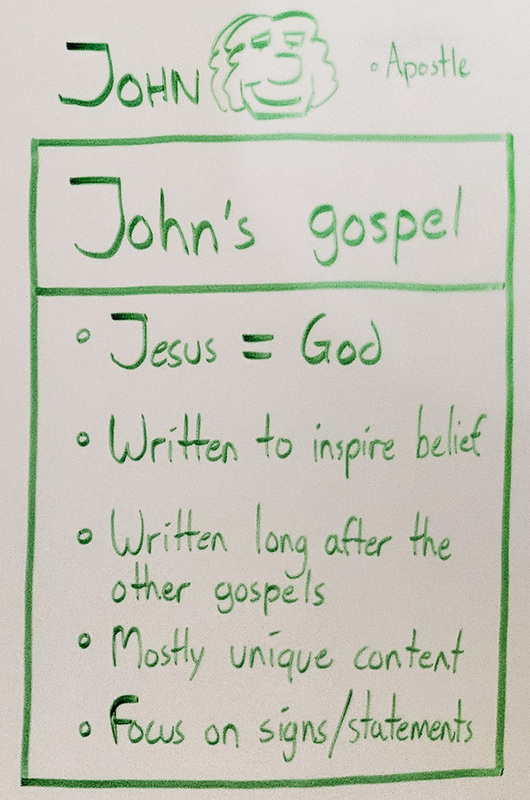 John is the persuasive Gospel. It’s written to show the miracles of Jesus, so that those who read his story will believe in him and have everlasting life (Jn 20:30–31). John’s account of Jesus’ teachings and miracles emphasize the divine nature of Jesus Christ. To John, Jesus is the cosmic Son of God, come to destroy the works of the devil. The whole book is arranged to present Jesus this way. That means the gospel of John has a very different feel from the other three. The way the gospel starts is a good example. Mark begins with Jesus’ baptism. Luke begins with the happenings surrounding Jesus’ birth. Matthew begins with Abraham, and traces the generations down to Jesus. But John takes us all the way back to the very first words of the Bible: “In the beginning” (Jn 1:1). John is telling the story of the divine being who became flesh, dwelt among us, and died so that we might have everlasting life. You can read an overview of John’s gospel here. The gospels, like the other books of the Bible, were intended to be read in one sitting. That doesn’t mean every time you read from John you need to read the whole thing. But it does mean that if you want to know one of them better, you should set aside an hour or so to read the whole gospel in one go. This gives you a feel for the general “flow” of the gospel’s narrative. You’ll notice different recurring motifs. You’ll see how the tone shifts in different movements. How does Jesus react to different situations? What pleases him? What upsets him? What does Jesus tell people to do? Very interesting summary, thank you. Thank you for this…I love it. 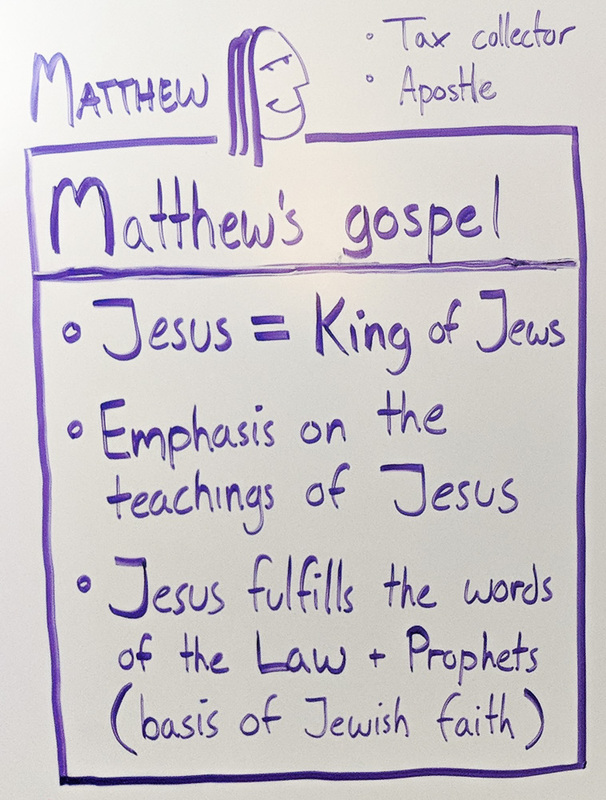 I am trying to place an emphasis on just the 4 gospels for my ‘tween group of students and this is working well. So many other curriculum get too bogged down in the Old Testament. Although there are places where the Old Testament plays a role, I want the kids to know what Jesus said. Love your fresh and interesting work Jeffery… thanks so much for making it available. I am always looking for fresh and innovative ways to learn myself and to teach others. It’s good overall however the conclusion that Luke may not have been a Hebrew may be erroneous. He may have been a Hellenized Jew. There is no definitive proof either way. I recommend Zola Levitt’s article on this subject. https://www.levitt.com/essays/luke. That is very vague and ambiguous and if you presented it as being credible to any authoritative religious institution without sources needless to say it would be deemed unacceptable. Could you please share some scholarly sources for which you base your conclusion on? It’s very important that we back up anything we say when asked and not be under the impression just because one of us says something it must be true. 1. In Paul’s letter to Philemon, he includes Luke in the same list of “fellow workers” as Mark and Aristarchus (compare Col 4:10–14 to Phlm 23–24). 2. Where does the Bible describe Luke was Paul’s “personal historian and physician”? 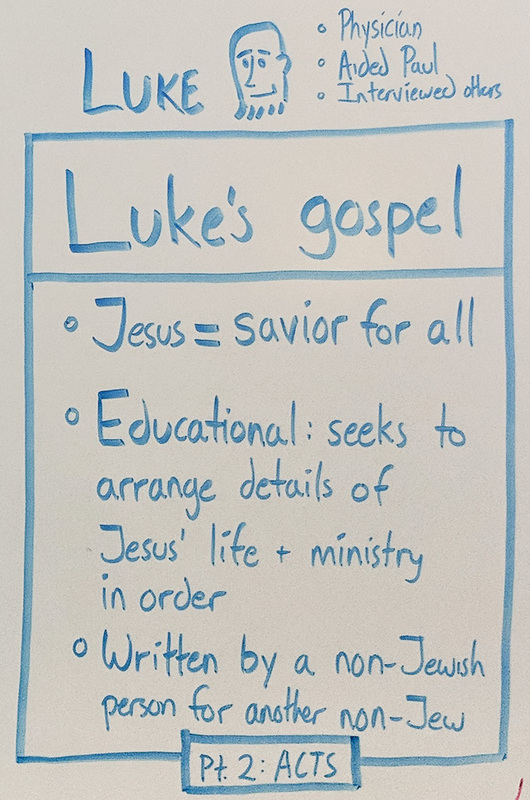 There’s more biblical argument for Luke being a Gentile than for Luke even writing the gospel and following historical account attributed to him. So very meaningful! Concise and comprehensible. Thank you, a great addition to my Bible studies. Hi, Wayne! You might want to subscribe to my Youtube channel. That should do the trick! I like your bible charts, pointwise study, it’s interesting. I use such method in my teaching to my class. Thank you Sir. You are working hard to dig deep in scripture. It will be helpful to me. An interesting and explicit explanation. Thank you. I love these videos! Well worth 10 minutes of our time to view. It concerns the Hebrew word ‘tsemach’, also spelled zemach, which means branch. The study is too long to post here, so let’s start in the middle: there were four prophecies of the savior. Relax now, that is the last of the verses. Now we can put it all together. Now we can see the reason for four gospels: the savior was prophesied as a servant, a king, a man, and the son of God. There are five prophecies, but the reference to a king is repeated in Jeremiah, so there are four different aspects of his life to be documented. 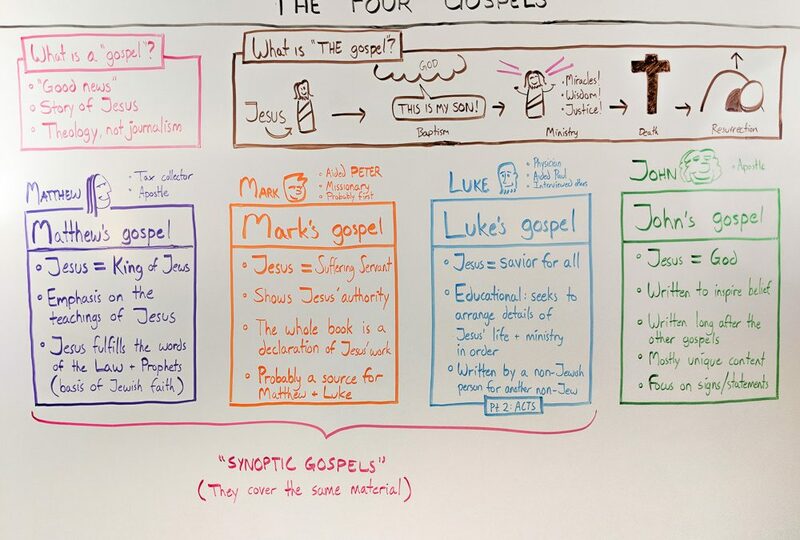 Each gospel treats one of these four aspects. Matthew is the story of a king. The genealogy in Matthew is the royal line, in ascending order because a king traces his ascent to the throne. It is in Matthew that we are told of wise men bringing gifts of gold, frankincense, and myrrh: the traditional gifts to a king. It is in Matthew that another king tries to murder the infant Jesus to protect his own status. It is in Matthew that Jesus declares most of the new, stricter interpretations of the law of Moses, acting on his kingly authority. In Matthew we see the pageantry of an angel rolling the stone away from the tomb and sitting upon it. The other gospels just say the tomb was open. Mark is the story of a servant. It begins, with only a slight preamble, where Jesus’s ministry begins. Very little of what Jesus said is recorded, since a servant’s opinions and pronouncements are important only insofar as they come from his master. His last words are not recorded, he just “cried with a loud voice.” Mark is a short, terse record of where Jesus went and what he did. There is no genealogy because a servant has none. Luke is the story of a man. As such it has a man’s genealogy, recorded in descending order because a man traces his descent from an ancestor. The genealogy in Luke is the legal line, beginning with “as was supposed”, which is a legal term meaning “determined by law”. The genealogy in Matthew is the kingly line, recorded in ascending order because a king traces his ascent to the throne. The genealogy in Luke says so-and-so “son of” so-and-so, and some of the names were in fact adopted sons. But in Matthew it says so-and-so “begat” so-and-so, a purely human genealogy. Mark has no genealogy because a servant has none.